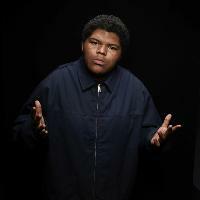 A-F-R-O (All Flows Reach Out) is an 18-year old MC from Los Angles, CA. He first gained notoriety in 2014 for an audio submission to R.A The Rugged Man’s ‘Definition of a Rap Flow’ contest, which quickly went viral. R.A. described the submission, saying “this kid won the contest before it even ended!” It became a platform to showcase A-F-R-O’s “off the top” ability; witty word play, distinctive voice & a complexity to his rhyme schemes. A-F-R-O quickly captured the attention of notable figures in music. Questlove is quoted as saying, “A-F-R-O is the future of Hip-Hop.” Queen Latifah personally requested him to perform on her talk show. He’s been invited into studio sessions with producers such as DJ Premier, Erick Sermon, Pete Rock, Prince Paul, DITC, Marco Polo & Mr. Green. Here are the latest A-F-R-O mixes uploaded to Soundcloud. Do you promote/manage A-F-R-O? Login to our free Promotion Centre to update these details.